Inter-Dimensional Music: The Gnarliest Mix of Floaty Psychedelia, Irie Cosmic Metal, and Non-Denominational Spiritual Music. 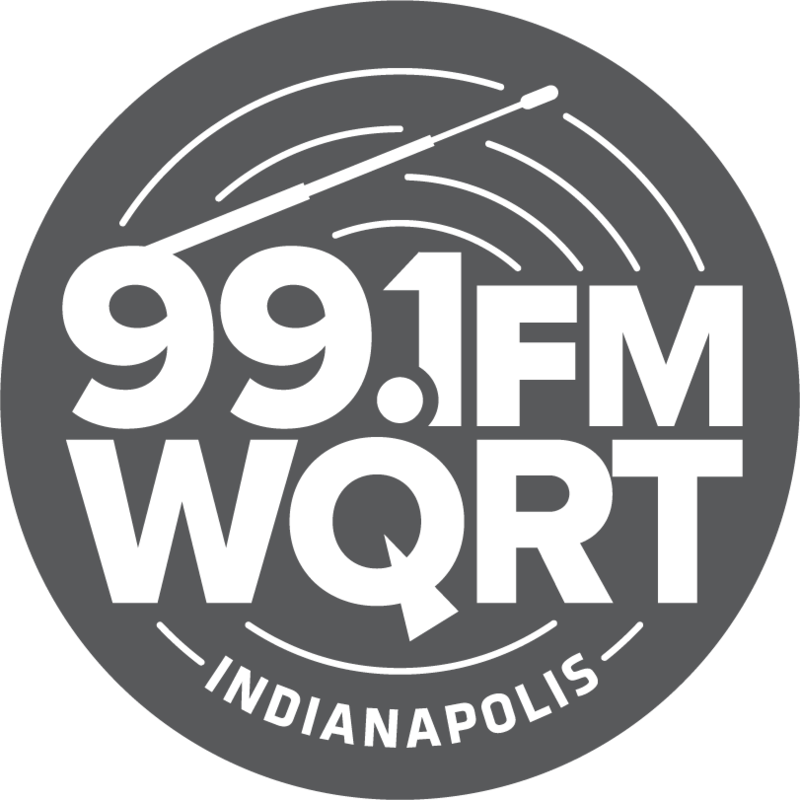 Heard every Friday from 3-4pm (ET) on 99.1FM WQRT Indianapolis, and the first Sunday of each month from 9-11pm (CT) on 93.5FM KRTS Marfa Public Radio in Far West Texas. 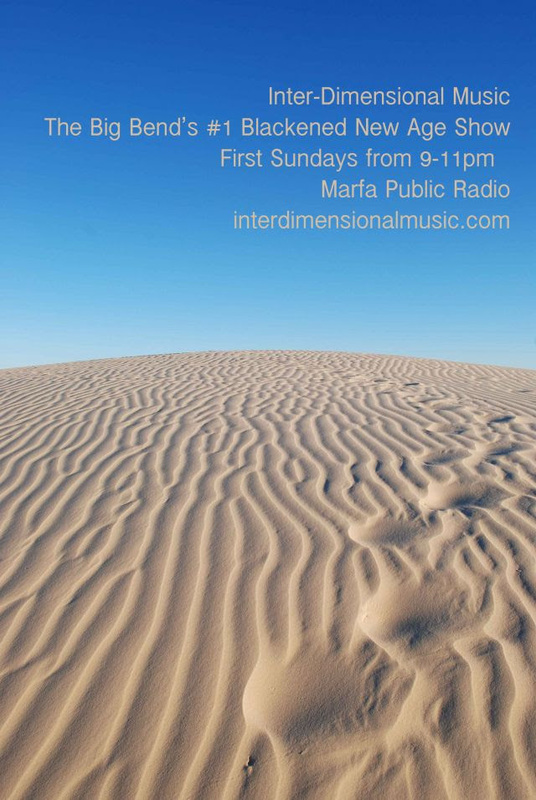 Inter-Dimensional Music returns to the airwaves of the Big Bend on Sunday, October 4, 2015 from 9-11pm (CT). As always, you can hear us the first Sunday of every month on air at Marfa Public Radio, broadcasting across the Trans-Pecos at KRTS 93.5 FM in Marfa, KRTP 91.7 FM in Alpine and KDKY 91.5 FM in Marathon. You can stream the show live at marfapublicradio.org, follow along @CosmicChambo, and find intermittent updates at interdimensionalmusic.com. Subscribe to the ID Music newsletter and never miss a broadcast! 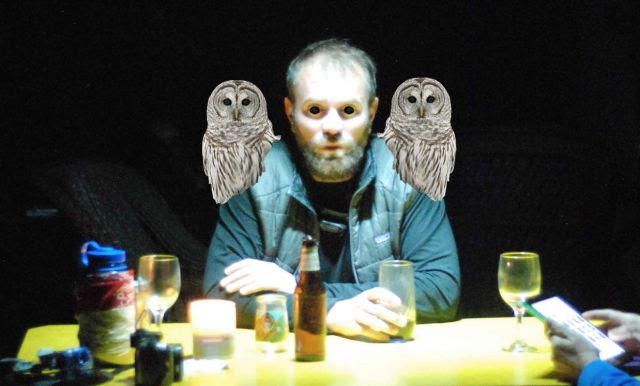 Tonight’s show is inspired in part by the Barred Owls of Owl Pond, and the Adirondacks camp where your host spent the early part of September in communion with his family of cousins, aunts, uncles, mosses, ferns, mushrooms, trout, ospreys, damned cormorants and the aforementioned birds. Listen for Barred Owl calls throughout the broadcast. ID Music will also feature some new field recordings from Pinto Canyon Road by People & Sounds podcaster Katherine Rae Mondo. In the first hour, new music from Matthewdavid’s Mindflight and Sun An, some (allegedly) old music from Kon Teifi, and classic ‘80s New Age from David Casper and William Linton. In the cosmic metal hour we’ve got some thoughts on loneliness, desolation and love from Marissa Nadler, Windhand and Chongyam Trungpa, along with fresh jams from Black Breath, Deafheaven and Vanum. 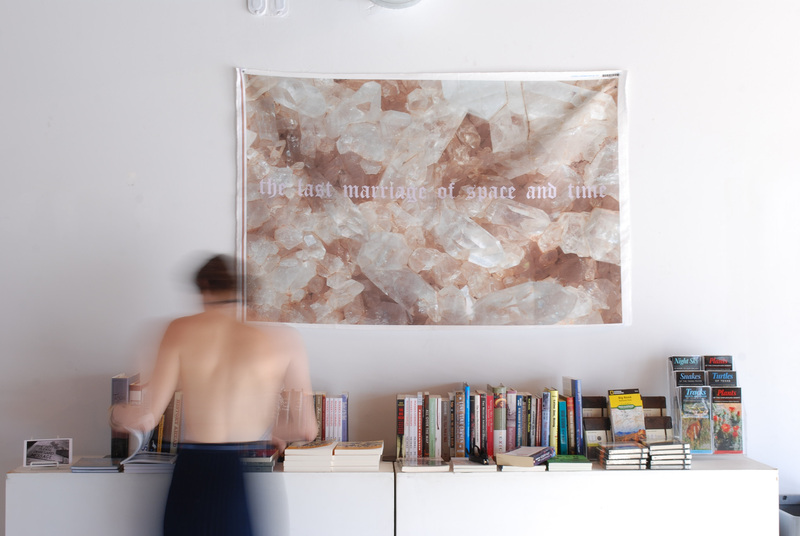 The Last Marriage of Space and Time, my show featuring linen-cotton canvases inspired in equal parts by J.G. Ballard’s The Crystal World, the tapestries of William Morris, and the back-patch art of the metal and punk communities, came down last week. 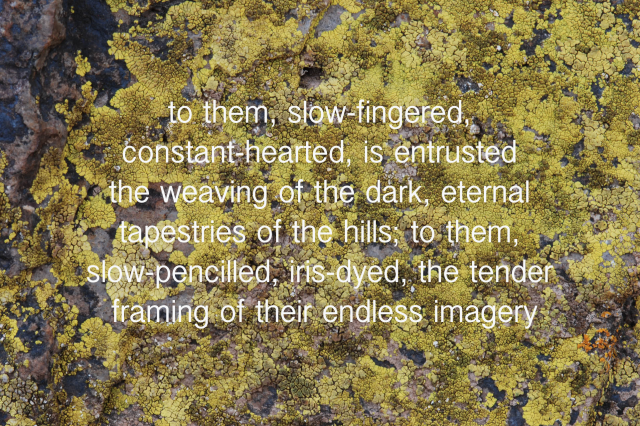 Exhibition documentation is now online at Into the Green. The 56” x 38” works are printed in an unlimited edition on linen-cotton canvas, and are available from Marfa Book Company for $200 plus shipping. Contact them here. Wildflower Sigils and Mantras is still on view at the bookstore; these unframed, unlimited-edition prints are available for $100 and $150. Works are printed with archival inks on Hahnemühle Bamboo paper by our friends at Color Wheel Digital. Contact the good people at the store for ordering information. 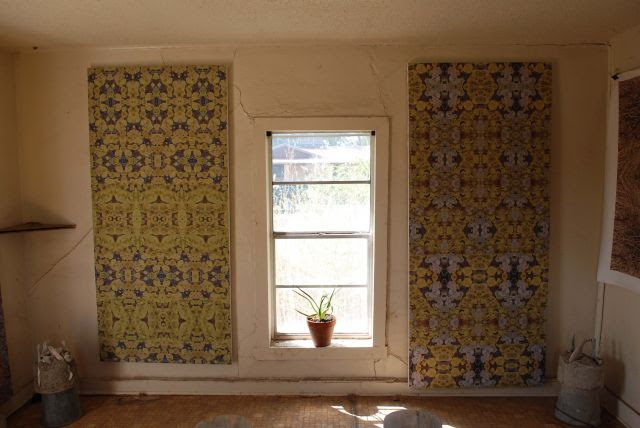 There’s also a new show at the squat gallery (aka the South Plateau Adobe Ruin) including works in concrete and bone by Tyler Spurgin, and an installation of my lichen canvases. Contact either one of us to schedule a visit. The gallery is hosted in an abandoned building at the south end of Plateau street in Marfa. If you visit independently, please use an inside voice, don’t bother the wasps, and enter at your own risk. Listen to Tom Michael’s Desert Surf Films interview with Ballroom Executive Director Susan Sutton, Desert Surf filmmaker Ian Lewis and yours truly on Marfa Public Radio. Katherine Rae Mondo’s “West Texas Talk” interview with me and other Far West Texas EMTs about the existential and tactical challenges of life as a medic can be streamed and downloaded from Marfa Public Radio, or as a People and Sounds podcast. Stay tuned to Marfa Public Radio and listen later this month for my interview with Lannan poet and NCAA basketball champ Natalie Diaz as we talk about her Marfa residency, her work with the last speakers of her people’s Mojave language, and her first collection of poetry, When My Brother Was an Aztec. Inter-Dimensional Music – the top-rated “New Age Talk” broadcast in the Big Bend since 2010! – returns to the airwaves tonight, Sunday March 1, 2015 from 9-11pm on Marfa Public Radio. Also always streaming live at marfapublicradio.org, and *rarely* archived at interdimensionalmusic.com. We’ll be joined in studio tonight by itinerant Root Stratan Maxwell August Croy, who’s returned to Far West Texas for self-imposed exile/residency. We hope to hear more of the music he’s been working on, including a soon-coming collaboration with another friend of the show, cosmic harpist Mary Lattimore. 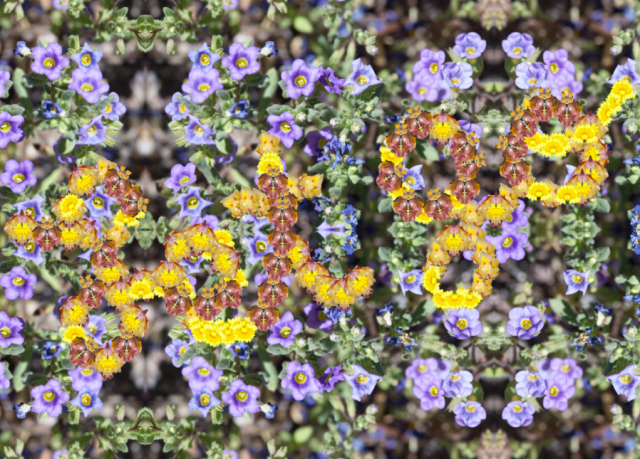 We’ll also be talking high desert mind expansion strategies while cycling through psychedelic folk music (watch for the obligatory Dead jam), and maybe some downpressing folk metal so as to make sure our silver linings have more than a touch of grey. 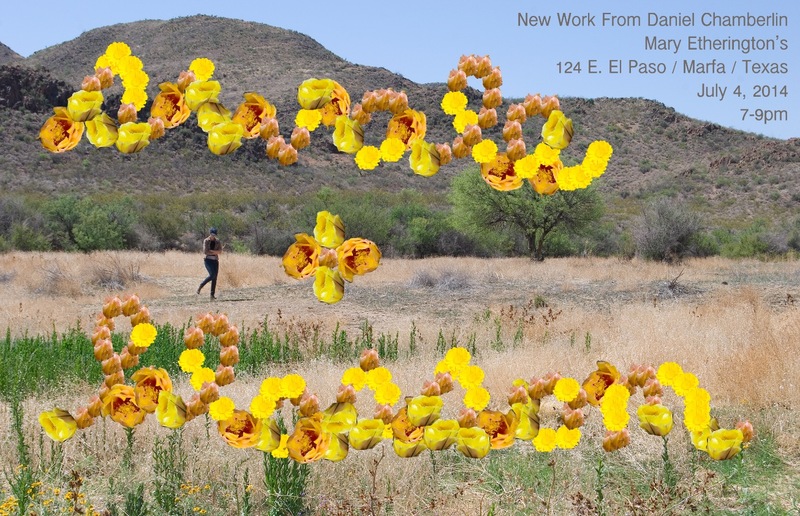 We’ll also get into some music from the Marfa Myths festival, which arrives in these high desert grasslands on March 13 for a weekend of sound bathing, tape chanting and other irie activities featuring New Age-allies well known to ID Music listeners, such as Bitchin Bajas, Grouper and Jefre-Cantu Ledesma. Keep an eye on Marfa Public Radio and Ballroom Marfa for more coverage. We’ll be back later this March with more news about Chambo’s next installation, a collection of photo-based works informed in part by the writings of Victorian proto-ecologist (and erotophobe?) John Ruskin. 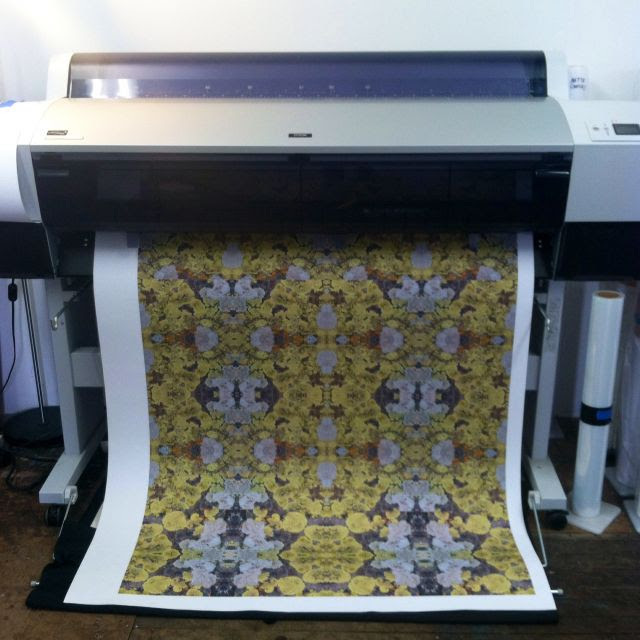 Fresh lichen prints are making their way to Marfa from Color Wheel Digital in Baltimore, destined for the expanding plant-mind meditation zone already in progress at Etherington Art. Watch intothegreen.wordpress.com and danielchamberlin.com for updates.